Not surprisingly, churches are top of mind in December. According to Lifeway Research/Catalyst Creative, the 18% average weekly church attendance skyrockets to 47% on Christmas Eve. For churches conducting capital campaigns, they are challenged to increase their awareness typically for an extended time period. 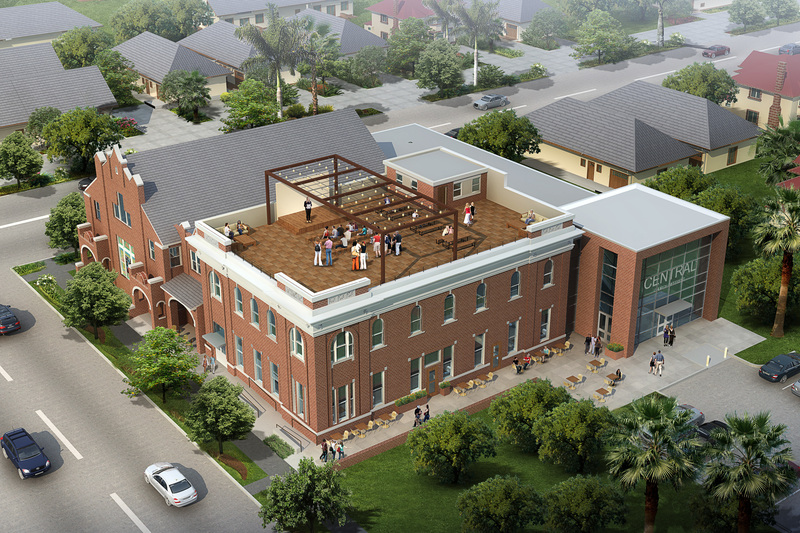 PRISM works with several architects to develop engaging renderings congregations can use year-round to raise funds to meet the mission and ministry needs of churches. Merriman Holt Powell Architects has several liturgical projects in fundraising mode. Bellaire United Methodist Church, shown above and below, has embarked on a $3.5 million Forward campaign to renew and revitalize the church’s existing facilities to better serve its growing ministries and improve its most utilized spaces. Creating a clear, inviting front entry from Bellaire Boulevard is a vital part of the project. 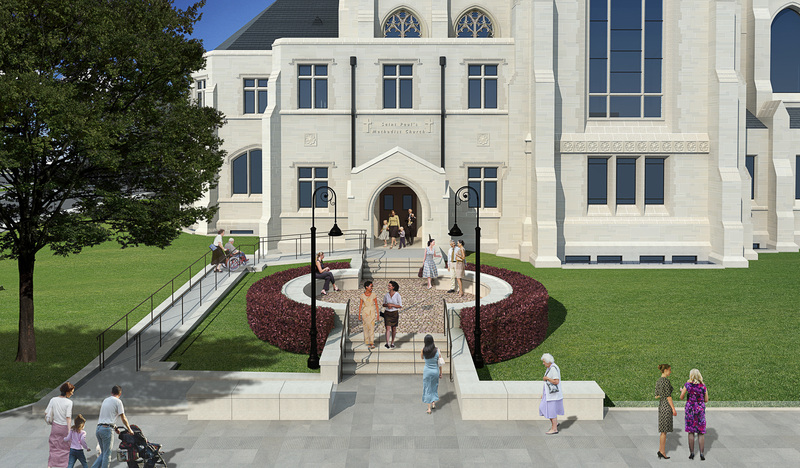 The new front plaza and trellis will provide outdoor space for fellowship and a welcoming image to the neighborhood. 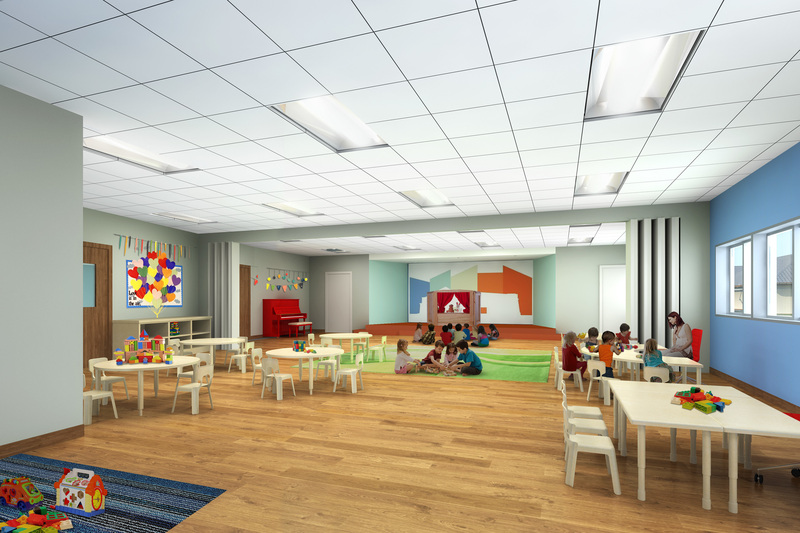 Interior improvements of the lighting, audio visual systems, accessibility, and finishes for the Fellowship Hall, Kitchen, Sanctuary and general public spaces will modernize these highly used and visible spaces. PRISM developed an exterior and several interior renderings to communicate the campaign details to the congregation. St. Paul’s United Methodist Church has almost completed their $10 million Revive campaign, their largest since the original building was first constructed in 1929. The project addresses a host of needed improvements for the historic 1929 Sanctuary Building design by legendary Houston architect Alfred Finn. The project will replace outdated mechanical and electrical equipment, repair building exteriors, and renovate the building for improved accessibility while retaining the magnificent building’s historical integrity. At Central United Methodist Church Galveston, they planted a new church in an existing historic building under the campaign “Redeem a church. Redeem a community.” Now the church is working toward the future in a Master Plan phase to revitalize the buildings including the original 1916 Sanctuary. All three existing buildings will be renovated in the future to provide spaces that work for the church’s mission and the surrounding community. This includes enlarging the current Sanctuary and updating the audio-video systems and electrical and mechanical systems while maintaining and improving the current, relaxed and light-filled sacred space they are utilizing. The original Sanctuary is currently used as storage, with some classroom space, and will be modernized and adapted to a Fellowship Hall and coffee shop, retaining all historical elements and restoring the open volume. The classroom building will be re-planned and updated into flexible, modern classroom and office space. As we prepare for the coming year, we take pause to reflect on 2018. We believe the concept of looking back to move forward has been a powerful force to grow PRISM. This process allows us to refine how we work, better anticipate the future, and build on the successes we’ve had. Most importantly it crystallizes how critical every client is. THANK YOU to our clients for your belief in us! 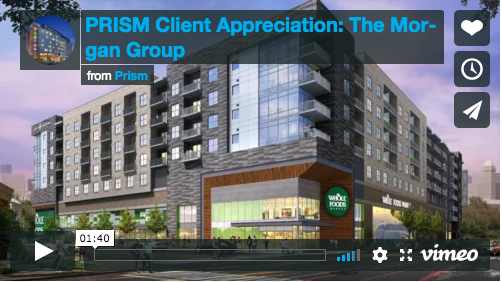 To date this year, PRISM has completed more than 235 total projects, has over 100 clients, and worked with 46 new clients. Our work spanned the U.S., with projects in Arizona, California, Colorado, Florida, Georgia, Illinois, Maryland, New Mexico, North Carolina, Pennsylvania, Tennessee, Texas, and Utah. Internationally, we had projects in Canada and China. Of course, we also take this time to celebrate the people who make PRISM what it is. 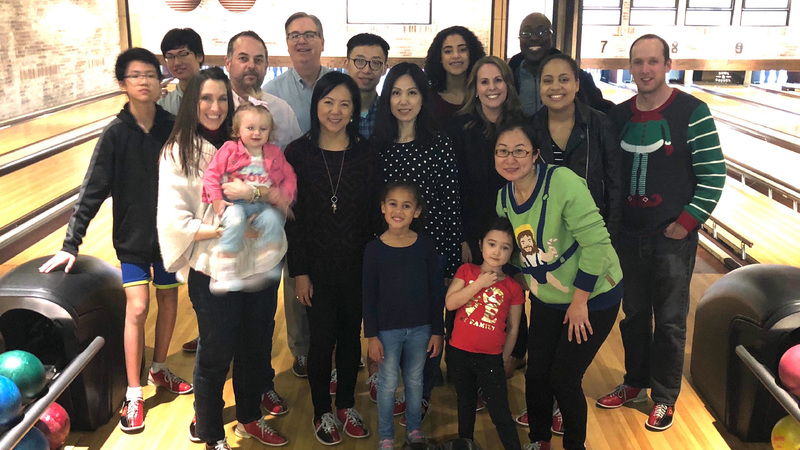 Our staff and their families gathered, from as far away as Boston, to celebrate each other with a delicious dinner and fun bowling outing. Thanks be to God for our amazing loved ones who support us every day! Bill Morgan was born in 1925 in southeastern Poland. He was 14 when the Nazis invaded, 16 when he escaped the Stanislawow ghetto, and 24 when he boarded a boat for New York. He was a serial entrepreneur who founded and sold several businesses before starting Globe Construction and Management Company in 1959. Morgan’s sons incorporated the business as Morgan, Inc. in 1987. Today MORGANdevelops, builds and manages luxury multifamily units such as The Pearl brand; the company has properties in 14 markets with a portfolio value of $1 billion. 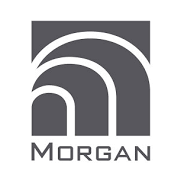 MORGAN epitomizes respect for all those they work with and provides uncompromising quality in what they do. PRISM is honored to serve them in fulfilling their mission. BIM is no longer a nice-to-have part of AEC projects. Even if not mandated, it’s a critical service to improve the entire design and delivery process. PRISM is excited to announce our affiliation with Axoscape. Axoscape provides BIM, CAD, Revit, and technology consulting services strictly for AEC clients. Whether assisting clients new to BIM or veteran users who just need an extra hand, Axoscape has experts in all the latest technologies firms need to stay competitive. Axoscape founder Dat Lien started the Houston Revit Users Group as a forum for users of all levels to share knowledge and advance BIM. PRISM is sponsoring the first meeting in 2019 and we invite all our industry friends to join us. The meetup group has more than 450 members; meetings are a great way to share ideas about new and effective ways to use BIM and showcase project work. We hope to see you on January 8, 2019! Since its founding 45 years ago, the MD Anderson Children’s Art Project has generated over $30 million to give back to educational and recreational programs for pediatric cancer patients. Did you know your renderings can contribute to this program? Every December, PRISM donates 10% of our profits earned on all new rendering and animation projects commissioned during the month to this worthwhile program. Please give me a call to talk about your project today! From all of us at PRISM, we wish you every blessing of the holidays!